This module effortlessly expands your ACR BUSINESS SYSTEM delivering data and administration consolidation for multi-store businesses. A single hardware platform (typically located at head office) that feeds your remote stores via a VPN Internet connection. Under a single server configuration, remote outlets trade as an extension of the head office business. The remote outlet shares the same data as head office including inventory, debtors, creditors etc. Each outlet is allocated a stock area to maintain individual location stock levels. This configuration provides for a dedicated server at each store. By having multiple servers your business is protected from ‘single point of failure’ and ensures there is no down time in the event of data connectivity interruptions to head office. Multiple Servers also provides numerous options for sharing core data and inventories. Data is synced at regular intervals providing standalone functionality at each location, while still providing Head Office data centralisation. No more handwritten orders in triplicate. m-Orders takes the power of your ACR Business System on the road and links your mobile Sales people / Account managers directly with the warehouse or office. Where you have mobile coverage you have a "live" connection with the warehouse. 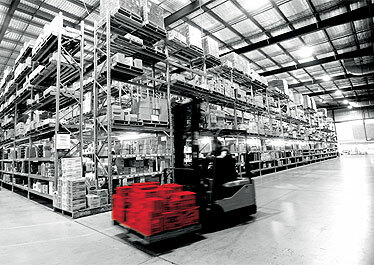 Orders may be remotely transmitted to the warehouse enabling immediate picking. Full integration of many systems and technologies. An essential module for today’s warehouse environment. At the heart of the module is a hand held, wireless computer terminal with a built in scanner. The versatile hand held device dramatically improves picking, packing split zone ordering and stocktaking. A powerful and versatile communication and translation program that "talks" to other business systems. B2B is an essential module for seamlessly transferring data between other businesses and offices. This in one of ACR’s quiet achievers that delivers an immediate return on investment. ACR eDocs module has revolutionised many facets of our clients businesses by dramatically reducing document handling, printing and postage. This one module has the potential to transform a business’s office operations by decreasing document handling and dramatically reducing printing and postage expenses.